Our friend Katherine Shaughnessy is visiting us from her digs in West Texas. Don't miss this opportunity to spend an afternoon with a very special person, talented artist, and knowledgeable teacher. All skill levels are welcome to this crewel workshop which will cover the basics of embroidery in addition to eight crewel stitches and finishing techniques. 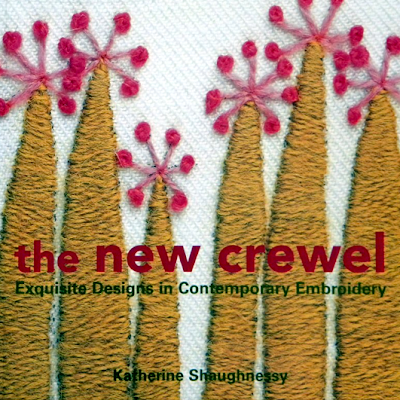 Workshop participants will receive all the supplies needed to get started including Shaughnessy's book, The New Crewel, which offers 30 of her original designs, 15 fun projects, and 16 classic embroidery stitches. Additional crewel kits and supplies will be available for sale at the workshop. Please visit our website to preregister for this class.